It’s been over two years now since Michael Jackson died in somewhat mysterious circumstances. However his mantle as the King of Pop will never be taken away from him and his musical legacy, which has now taken on mythic proportions, will outlive you and me both. 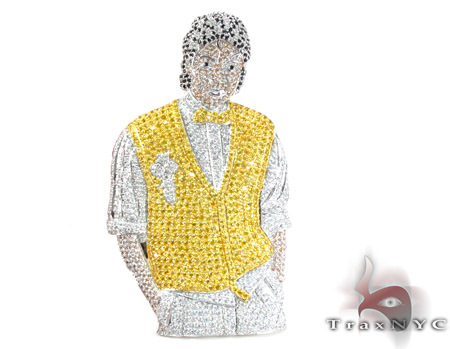 With that in mind, today we would like to introduce you to one of the finest pieces of pop memorabilia out there: The TraxNYC Michael Jackson Custom Pendant. This pendant has been manufactured by our esteemed Custom Jewelry craftsmen for one of our MJ-obsessed diamond jewelry customers. They provided us with the idea and we took it from there. At TraxNYC we are renowned for being completely unafraid in our Custom Jewelry endeavors – we know we have the ability to create anything you can imagine, so we never shirk a challenge. The Michael Jackson Custom Pendant you see here is a first edition, manufactured from 168 grams of white gold-dipped silver and the highest quality CZs using the latest Custom Jewelry techniques. Our manufacturing system is streets ahead of what is generally accepted as the norm in the industry; we use state-of-the-art technology to ensure your vision is replicated exactly in accordance with your desires. Remember this Michael Jackson piece is a custom pendant, therefore should you decide to have it remade you can choose to have it cast in pure gold and real diamonds which will make it even more outrageous – if that’s even possible! Contact us today to learn more about this amazing Michael Jackson Pendant. TraxNYC – Masters of Custom Jewelry.